↑ "List of Crown Dependencies & Overseas Territories". fco.gov.uk. Foreign and Commonwealth Office. अभिगमन तिथि 11 नवम्बर 2012. ↑ Roach, John (13 सितम्बर 2006). "Neandertals' Last Stand Was in Gibraltar, Study Suggests". National Geographic News. National Geographic Society. अभिगमन तिथि 11 नवम्बर 2012. ↑ अ आ इ "Nunswell". aboutourrock.com. About Our Rock. अभिगमन तिथि 11 नवम्बर 2012. ↑ "The Essential Gibraltar". liftedmagazine.com. Lifted Magazine. अभिगमन तिथि 11 नवम्बर 2012. ↑ Wright, George Newenham (1840). The shores and islands of the Mediterranean. पृ॰ 26. अभिगमन तिथि 11 नवम्बर 2012. ↑ अ आ इ "Nun's Well Gibraltar". gibraltar.costasur.com. CostaSur.com. अभिगमन तिथि 11 नवम्बर 2012. ↑ "Map - Nun's Well". maps.google.com. Google Maps. अभिगमन तिथि 11 नवम्बर 2012. ↑ "Gibraltar Water Supply" (PDF). aquagib.gi. AquaGib. अभिगमन तिथि 11 नवम्बर 2012. ↑ Bethune, John Drinkwater (1786). 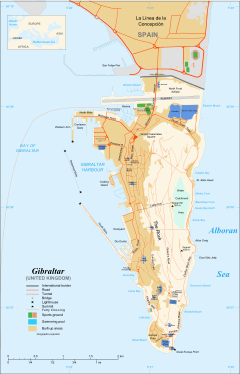 A history of the late siege of Gibraltar (2 संस्करण). पृ॰ 34. अभिगमन तिथि 11 नवम्बर 2012. ↑ Bethune, John Drinkwater (1786). History of the Late Siege of Gibraltar. अभिगमन तिथि 11 नवम्बर 2012.